It has been a while since I reviewed an Ozobot product, with my first being the Ozobot Bit. I was attracted to them at a CES a few years back, and they were these tiny robots that would follow lines drawn on a table. Yes, these are tiny robots, and I realize that the picture makes it look like its the size of R2-D2 (or half of one, so that would be an R1-D1). 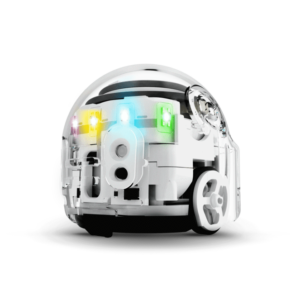 In actuality, the Ozobot will fit in the palm of your hand, like right in the concave section. Since it’s been a few years since I reviewed an Ozobot product, I’ll go over what it can do. This tiny robot can essentially just roll, but the user can code it to do all sorts of tricks. The coding is done with a program that is like Blocky, which is something that I have seen on other educational toys like LEGO MINDSTORMS and UBTECH. I can’t remember if the Bit had this feature, but the EVO has these “expressive” LEDs. With a little coding, you can make it do tricks like roll along until you stop it just before your finger. Not to mention going along a line. I see that this is really difficult to describe, so I’m just going to show this video. It says that you can program these EVO robots to battle, and they have some kind of mutual multi-bot networking thing happening going on. I’m just going to end with and say that the EVO is something that should be tried and experienced. The Ozobot EVO is available on the Ozobot site for about $100 and includes a pouch, skin, markers, and a lot more to begin coding.